TTB should not allow alcohol content to be presented by way of ounces of pure alcohol and should not allow any format other than percentage alcohol by volume. On many containers, such as kegs, the panel format will not fit. TTB should exempt kegs, or at least allow the linear format. TTB has successfully used the linear format, on light beer, for more than 30 years. TTB should resist any temptation to make alcohol beverage labels look like FDA food labels, because the products, purposes and effects differ greatly. Miller brings up some very interesting points regarding the design of the labels, specifically the challenges of instituting arbitrary standards across multiple products, but we shouldn’t let them get away with damaging the industry through regulation. If Miller truly thinks these labels are “appropriate and timely” then they should go ahead and put them on their beer. It’s not as is there is a government regulation forbidding this type of information. The huge costs associated with these labels (as Miller specifically notes) may serve as a small speed bump for the major breweries, but will often prove cost prohibitive for smaller artisan and craft brewers. As consumers are becoming more and more discerning in their beer tastes, Big Booze is losing market share. They know a measure like this would create an uncompetitive advantage for them. Jeff: Miller probably does not have the option to do this until a rule gets finalized; TTB probably will not allow companies to guess about the final rule and start shooting in the dark prior to a final rule. You are completely correct in saying they can’t act right now. I was probably a little unclear in my previous comment. But what stopped them from doing something before CSPI’s initial petition in 2003? Maybe I can accept that the higher ups actually had a change of heart, or that it wasn’t on their radar before the initial filing and they actually think it is a good idea. The result, unfortunately, is the same no matter what Miller’s underlying principle is. Smaller brewers will bear a disproportionate burden to accommodate the regulations and Miller and the other booze giants will gain a non-competitive advantage over the market place because of it. I agree wholeheartedly with what Jeff is saying. Microbreweries and small wineries are eating the lunch of their larger competitors. Companies like Miller and Diageo (which also strongly supports this measure) are pushing this proposal for the sole purpose of increasing costs on their smaller competitors. No company begs the Federal Government to regulate them, unless there is a benefit to their bottom line. Just my two cents! Great blog by the way! The industry can put nutritional information on product containers if they so wish. The information must follow the standard nutrition label as seen on current light and low-carb beers. Unfortunately, soon after the TTB made this “temporary” ruling, they also started the petition drive, indicating that a real labeling change might come. The drink industry’s radar went up. For any brewer, vintner or distiller who wants to voluntarily change their product labels today and add nutritional info, that would mean destroying an entire inventory of current labels, and then if and when the TTB comes up with their own mandated version, filled with changes that differ from current standards, the manufacturers might have to destroy their label inventory once again. The TTB has said they would give the industry 3 years for conformity, but who wants to take a monetary chance? 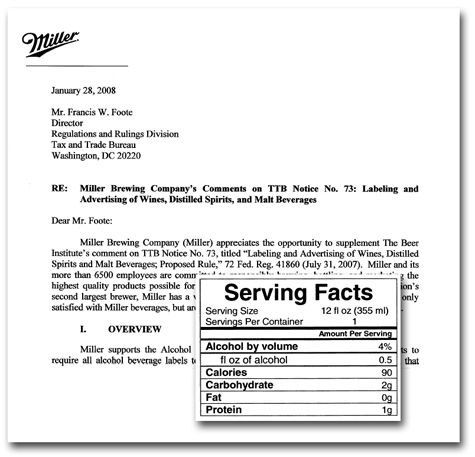 Diageo, for instance, was ready to relabel their products back around 2004…even sent out a press release after using the services of a pollster firm that found that the average consumer wanted to see nutritional info on adult beverages. Once the TTB ran the comment drive, however, Diageo stopped this idea dead in its tracks. I don’t know about this Bob. I am pretty sure TTB will not allow companies to guesstimate the final rules and start now. In fact, in the Diageo comment, Diageo is grumbling about why can’t they start now. This was based on an anticipated interim ruling by the TTB that did come out on April 7, 2004, a few months after Diageo’s announcement.